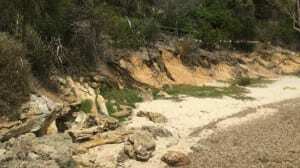 The City of Melville required foreshore protection in the form of rock revetments, timber palisades, GSC beach protection and revegetation planting at Point Heathcote. 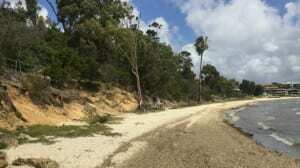 The objective was to stabilise the foreshore and cliff area. 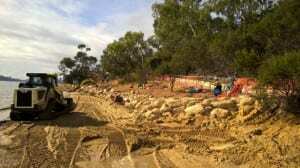 The use of specialised equipment such as a small excavator with rock grab attachment provided the City of Melville with value for money service, whilst minimising site impacts. 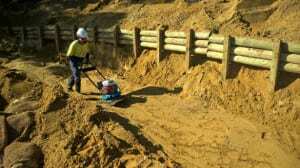 Trained and licenced operators with an environmental focus operated all equipment. Natural Area’s familiarity with expected standards and reporting frequencies ensured efficient delivery of all services with no project delays, minimising public use disturbance at the site. 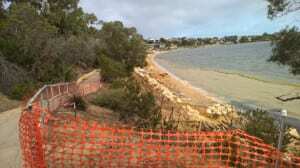 In order to place geotextile and amour rock to specified levels, the beach at Point Heathcote was excavated to -1.00m AHD. 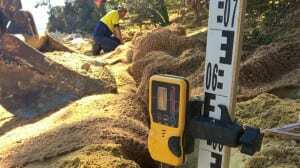 Natural Area utilise a laser level to ensure that depth requirements were accurately met and carried out he excavations with our in house team using an excavator and posi track to achieve the depths required. Natural Area used a front end loader to transport limestone armour rock from the designated laydown area to the works area. 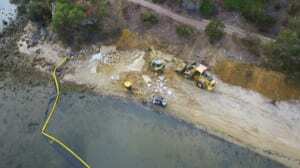 Spalls were moved into position using an excavator fitted with a rock grab and placed into position on top of the geotextile. The benefits of utilising a rock grab instead of a regular bucket is that the excavator picks up only the rock spall intended for use, leaving behind any sand and undersized rock that does not meet specifications and may impact on structural integrity. 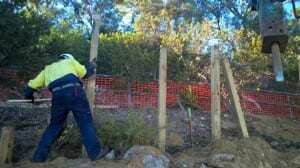 The rock grab also allows for accurate placement and manoeuvring to ensure a dense, fully interlocking armoured slope with minimum 3-point contact is achieved, as well as removal of individual rocks should a particular spall not fit appropriately. 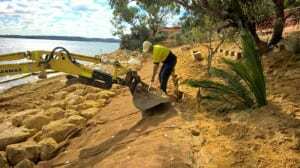 All revetment works were undertaken by Natural Area’s licensed operators, experienced in revetment construction to the specification issued. 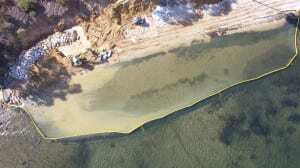 or other features protruding above the surface were removed. 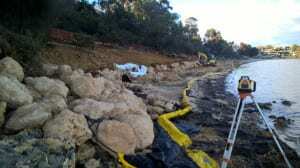 A geotextile underlay was secured in accordance with the requirements of the specification. 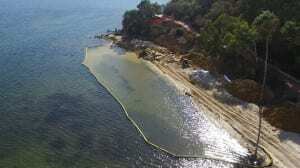 Gabions were installed and filled as per the manufacturer’s guidelines. Rock spalls for gabion fill consisted of granite with a minimum of two layers of rock placed in each basket. Natural Area utilised treated pine for timber palisade construction, due to the ease of workability and durability of this material. All palisades were placed to the lines and levels detailed on the drawings.